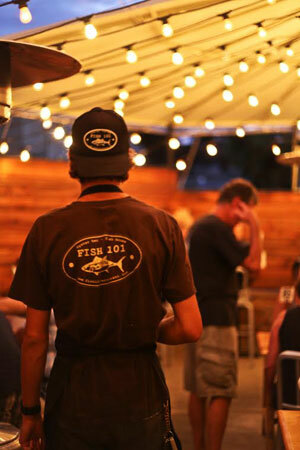 Beach casual, rustic fish house in the surfer town of Leucadia. : Husband-and-wife chefs John and Jessica Park descended upon Leucadia to create a casual eatery that favors fresh local fish at affordable prices and farm fresh produce. Start with house-made white chowder with manila clams and smoked bacon, or crispy calamari, lightly battered and paired with lemon aïoli. Yes, there are fish ‘n’ chips, but also beer-battered rock cod and tartar sauce. Po' boys come in three varieties: fried oysters, shrimp or rock cod. Tacos hold either grilled or from-the-fryer fish, with sides like seaweed salad or tasty Brussels sprouts. A kids' menu features fish sticks, grilled cheese or all-natural beef sliders, so small-fry can be sated while parents enjoy raw oysters or fish po' boys with craft beers. For lunch, try the Baja fish burritos or ahi tuna poke bowl. Dessert is a focus, as Jessica is an adept pastry chef delivering seasonal sweets. Capt’n Eli's root beer floater has a steady fan base spanning all ages, as does the ice cream swirls with salted caramel. The setting is understated and laid back, and the kitchen’s creations show its enthusiasm for local, sustainable ingredients.